I am emailing from a production company in London. We are making a show about antique restorations and I wanted to ask some questions about an antique 19th barbers chair we have. We want to know how the head rest may have been contracted as we are missing an element. It is currently a bare shell showing some springs. I have photos and more information if you need. If you think you could help it would be wonderful if you could email me to discuss further. If not, do you have any contacts who might specialise in this sort of thing? Don’t know what specific chair you have, but the headrest probably has (or had) some rollers and axles that held a small roll of thin paper similar to what’s still used on medical exam tables. On my chair, the paper roll would live in the bottom of the headrest, come out and over the springs, then go through two white rubber rollers. Rolls of this paper are randomly available on eBay. It’s common for people to make a flap of the same leather the seat is upholstered in to cover the springs now. 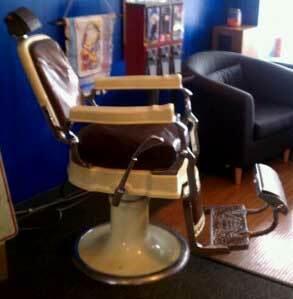 Please send the full physical address of J & N antique barber chair restorations and there website details (if possible). Straight 30-weight, non-detergent compressor or hydraulic oil. You may have better luck at hardware, rather than auto stores. I just purchased a Koken model 526a and wanted to know if this Particular type was a hydraulic style ? I have a Koken chair circa 1950. On the armrests are a bib for an ashtray and a nail tray for manicures. I have the ashtray but need the nail tray to complete the appearance of the chair. Any help?? After 60 years of sitting in the basement, I think it’s time to restore Dad’s Koken Congress barber chair. Everything seems to be there, but it needs a complete disassembly, cleaning and restoring. Is there a site anywhere that shows a ‘how to’ process to follow (especially with the hydraulics), or is it just a hit and miss procedure? Also, the chair has white enamel over the oak. Does anyone know if the original chairs were left natural or painted? Thanks for any input! I have 3 Koken Barber chairs & one will not recline all the way . We have tried to adjust the linkage but it will not stay locked. Any one that has that problem?? a brake pad to fit?